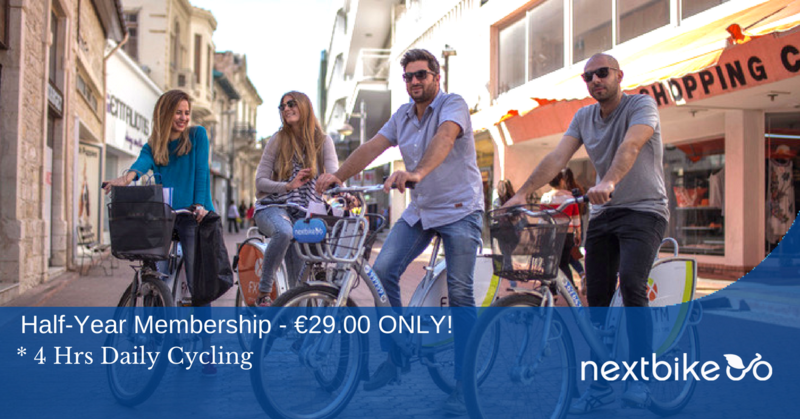 Enjoy 4-hours daily cycling for 6 months!Only €29.00! With an Half- Year Membership you’ll get for 4 hours trips per day for just €29.00. Whatever way you look at it, the savings are just the beginning. nextbike members don’t have to spend their time and money at expensive gyms. With a membership your daily commute becomes your workout, except instead of 4 hours on a soul-crushing treadmill, you get to enjoy cruising up and down Limassol’s streets. Get to work, go out to dinner, or grab a coffee with friends all while checking off that “workout” box from your to-do list. You were going there anyway – just get there by bike! Upgrading from Pay-As-You-Go or Monthly Membership to a Half - Year Membership means not worrying about paying for each separate trip you take . *Offer applies to new and existing customers as well.